Big news… Wanderer Book Four is finished! Well, the first draft is anyway. It’s rocked in at 145,000 words, with another 15,000 written but moved out to book five. 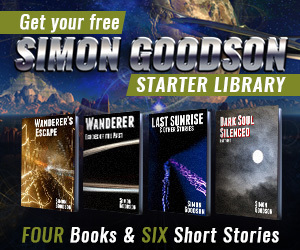 That compares to Wanderer’s Escape, the first in the series, being about 80,000 words. Yesterday saw me writing a mammoth 3,500 words to finish after 10pm at night, followed by a glass of red wine to celebrate of course. This is the phase where I go back over the work time and again, first off to check the story hangs together then later to spot typos, grammar errors and the like. It’s also the first stage at which I’ll run my suite of automated tools to catch problems – in particular hard to spot ones like two spaces as the end of a line. I’m hoping to complete this by the end of January, but until I get going it’s very hard to estimate. The next stage is putting the manuscript aside for a good long time, so I can return to it and read what’s on the page rather than what I know should be there. This stage will probably be about two months, during which I’ll be working on my next book, which takes us through to the end of March. After the break I’ll switch from screen to printed http://www.mindanews.com/buy-levaquin/ paper as it makes different types of errors stand out. I’ll read the entire manuscript again. Once I’ve made changes I’ll run the automated tools again (to catch the new errors I’m sure to have added). This stage is likely to take a couple of weeks. The scary moment that I first let someone else read the book. Not only read it but read it with the express purpose of finding problems. Depending on scheduling commitments and workload this could take between three and six weeks. If we allow six weeks then that takes us to the end of May. This means handing off to another proffesional, this time one who will be focusing specificallyon typos, grammar mistakes and the like. Another one where timing depends on someone elses schedule. Four weeks should be sufficient time, which takes us through to the end of June. I’m handling beta reading differently this time, with two phases. The main reason being that last time while correcting errors caught by the beta readers I actually introduced a number of new issues. The two phases together will take six to 8 weeks, meaning we should see the new book at the end of August. However I’m an optimist and there’s quite a lot of contingency time in the schedule overall so I’d hope to get it out by the end of July at the latest, and maybe sooner. As always keep an eye on this blog for updates.